by a group of specialists which were published in the Jouranl. Mr. W.W. Renouf, I.C.S., wrote on " Early Indian Cancellations" and "Indian Stamps Used Abroad", which were pioneer works on these subjects, and are still standard books of reference. At about this time Sir Edward Bacon published "The Proofs, Essays and Reprints of the First Issued Stamps of British India, 1854-55". Field Marshall Sir William Birdwood succeeded Sir Norman Macleod as President . This period was marked by new and startling discoveries in respect of the early issues of India 1854-55, and Col.D.R.Martin and Mr.E.A. Smythies published their classic monograph on "The Half Anna India 1854", perhaps the last word on the subject. This was followed by the memorable monograph on "The Four Anna Lithographed Stamps of India 1854-55" by the same authors. These two books were the basis of all future research on the lithographs of 1854-55. In 1928 Mr.C.D.Desai , a distinguished Indian philatelist, reconstructed the One Anna Die I "A" Stone", and this was followed by "The Unknown Setting of One Anna Die I, India 1854" by Mr.L.E.Dawson. After this Mr.CD. Desai wrote on "Indian 1854- One Anna August Printing "C" Stone". heritage of the country, its architecture, fauna and flora, important events, prominent personalities , etc., and the Philatelic Society played a large part in assisting the Postal Department in designing the new stamps. In November 1948 Mr.L.E. Dawson published his monumental work on "The One Anna and Two Anna of India 1854-55", followed by "The Hand Struck Postage Stamps of India " by Mr.D. Hammond Giles. Mr. R.F. Stoney, who had become President of the Society in 1949 and done research work on the stamps of Indian Feudatory States , was appointed a member of the Philatelic Advisory Committee set up by the Government of India. Federation of Philately, the FIP. In all these philatelic activities, the members of the Governing Council were actively involved as Members of the organizing Committee and/or the Jury.. On many of these occasions the Philatelic Journal of India brought out special issues of Journal which carried valuable articles. Considerable research work continued to be done during this period, published in various important Articles in the Society’s Journal, and Mr.M.A. Nayeem wrote on the Postal Stamps of Hyderabad and Mr.D.Hammond Giles published his classic work on “The Hand-Struck Postage Stamps of India”. In 1957 the Society celebrated its Diamond Jubilee in a befition manner with Various functions, the most important of and issued a Souvenir on the occasion. In March 1967 the Society completed 70. Years of its eventful existence and held suitable functions to celebrate the occasion, including a dinner. In this year the Society published the companion volume to “The Hand-Struck Postage Stamps of India” by D.Hannond Giles and distributed it free to its Members, as in the case of its other publications also. The first publication was award a large silver medal at the Philympia-1970” in New Delhi. The American Philatelic Society’s highest award-“The International Award of Philatelic Achievement’ – was awarded to Mr.Dhirubhai Mehta, the Editor of the Philatelic Journal of India, by Mr.Daniel M.Braddock, the American Consul General, at a special function. Mr.Dhirubhai Mehta has been editing the Philatelic Journal of India for the last 40 years and is an internationally known prolific writer and widely travelled philatelist. Mr.N.D.Cooper, a distinguished philatelist, had succeeded Mr.C.N.Chandra as President of the Society. The Society celebrated its 71st Anniversary by a successful non-competitive Philatelic Exhibition in Bombay, at which its President Mr.N.D.Cooper, F.R.P.S.L., was honored for his services to the Society and presented with a silver plaque. The Society held its Fortnightly Meetings regularly till 1969 in the Office of Mr.Arvind Pakwasa, For which it is grateful to him. From there the Meetings shifted to the Darbar Hall of the Town Hall, with the kind Co-operation of the Asiatic Society of Bombay. In 1970 Mr.N.D.Cooper resigned owing to ill-health and was succeeded as president by Mr.R.F.Shroff, an eminent philatelist especially in the fields of Indain Lithographs and the British Commonwealth, Mr.Arvind Pakvasa was elected as Vice-President. 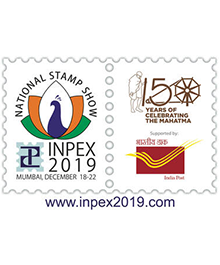 In 1970 Members of the Society won several high awards in the All Indai Philatelic Exhibition “Inpex 1970” held at New Delhi. The Dum Dum Stamp Exchange club was affiliated to the Society. Its activities consisted in circulationg the surplus philatelic material of the Members of the Society and it was ably conducted by Mr.R.F.Stoney. It survived for over fifty years and finally discontinued due to unavoidable circumstance. In 1971 the Society suffered a great loss by the death of Mr.D.E.Wadia, an eminent philatelist, specially in Lithographs, who had been the Honorary Secretary of the Society from 1962 to 1968 and had contributed many important articles to the Society’s Journal and had exhibited his Lithographs at the US International. Mr.K.D.dinshah succeeded him ad Honorary Secretary. He specialized in thematic collecting and was named as one of the two “Distinguished Topical Philatelists for the year 1971” by the American Topical Association – a great honour indeed. In 1973 several members of the Society won high awards at “Indiex-73”, the International Philatelic Exhibition held at new Delhi. The venue of the fortnightly meetings shifted from the Darbar Hall in the Town Hall to the Indo-American Society for some years, thanks to the courtesy of that Society. The Society suffered a great loss by the death of Mr.R.F.Shroff on 18.4.79. Mr.Arvind Pakwasa succeeded him as President, with Mr.B.B.Paymaster, I.C.S. as Vice-President. In 1981 the Society suffered another great loss by the resignation of Mr.B.H.Bhiwandiwalla on health grounds who had been its Honorary Treasurer for many years, and in whose office the Governing Council used to meet. Mr.Arvind Pakvasa resigned as President towards the used to 1981 and was succeeded by Mr.B.B.Paymaster, I.C.S. (Rtd), the Vice-President being Mr.J.D.Gazdar, a Philatelist of repute. Shri Dhirubhai Mehta continued to be the Editor of the Philatelic Journal of India, Mrs. D.M.Pittie was the Honorary secretary. In 1983 the Society held a successful competitive Philatelic Exhibition open to all its Members in India, and brought out a Souvenir on the occasion. The Exhibition was called “Philex-83 “ and was inaugurated by the then governor of Maharashtra, Air Chief Marshal I.H.Latif. The Philatelic Journal of India, the Society’s Journal, has been doing valuable service to its members and to the hobby. In recognisation of its role in philatelic literature, a stamp issued during the world stamp exhibition in 1989 depicting Philatelic stamp journals included the Philatelic Journal of India. In 1996 the society held a club level competitive exhibition philex 1996 of 200 frames as a pre centenary celebration it was a great success, many up country dealers also took stall beside India Post. Society celebrated its centenary in 1997 by holding centipex 1997 a national philatelic exhibition. If was first ever held show in such a large scale by a society in India. India Post issued a setenent stamp on this occassion for centenary of P.S.I. and its “Philatelic Journal of India” Mr. Dhirubhai Mehta succeeded Mr.B.B. Paymaster as a President of the society after Mr.B.B. Paymaster retirement due to ill health. Mr.J.D.Gazdari the Vice President re signed earlier due to his ill health. From the Indo-American Society's premises the Society shifted its fortnightly meetings to a space in the General Post Office kindly allotted by the courtesy of the postal department, and the meetings continue to be held there at present, and are well attended. The philatelic Journal of India is published by the Philatelic Society of India. First issued in January 1897. Available without charge to members of the society.